I did finally start sewing my ohio sky brick path quilt. I’ve only done 2 rows so far, so there’s 16 more to go before I can start piecing the rows together. I think besides my January blues and crushing unmotivation to do much of anything, I’ve had a lot of problems technically with this quilt. Funny because I was just saying a few posts down how easy and fast this would be! 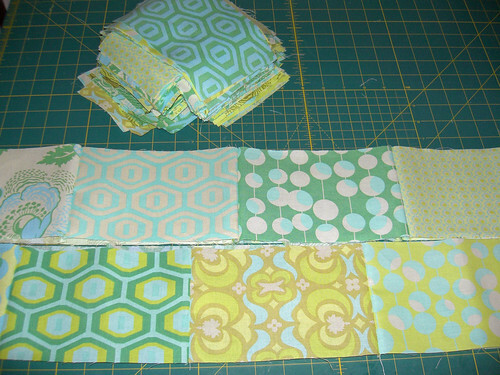 The first problem was that the fat quarters of fabric that I ordered from a fabric website to do this were cut totally crooked, and once I squared them and started cutting blocks instead of getting 12 blocks per fat quarter, I ended up only getting 6-9, with the rest being like 4″x7″…so there is a lot of blocks that are too small to use on this. They won’t go to waste, I’ll use them to do baby quilts, but it was super irritating. 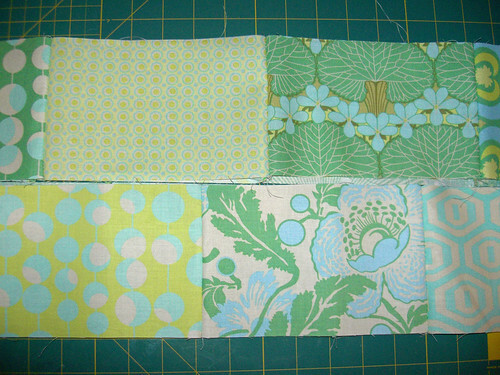 Then after I had sewed these two rows together, I didn’t really trust my randomness in picking the fabrics out of a bag to sew together, so I decided to pick the rows and have them ready to sew ahead of time. Thats that large stack of blocks above my lonely rows. Well , when I counted the number of stacks I had, guess what…I’m one short I’m so angry! So that pretty much halted everything as I was so disgusted at these stupid crooked fat quarters and all those wasted blocks I just lost any sort of inspiration I had to continue on this thing. So I have two options, go to a joanns and try to find a fabric (a solid maybe?) that would coordinate that I could mix into the other blocks to finish, or the other idea I had was to just use the too small blocks and make a top and bottom row, but I think that will look kindof stupid, so I dont really want to do that either. So any advice would be greatly appreciated! I try to appreciate the irony in a project so simple has become this completely arduous task, but right now, its hard to find the humor. I just wanted to get this done…hopefully after this weekend and a trip to joanns, I will be back on track.